Designed and made in the USA! Commercial Quality and built to last! Perfect Retro Dining with dynamic red and white color theme! 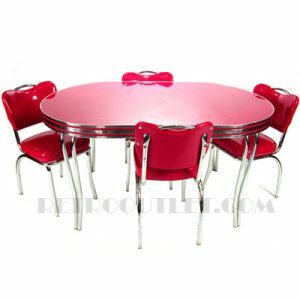 Our Retro Oval Dinette Set 36×48 provides comfortable seating for four featuring a fabulous retro design. The table is trimmed with 2.25″ real metal banding with our retro-style double pole legs. Completing the set are four Malibu Handleback Chairs with a contrasting middle channel insert and piping, and a 2″ Sewn Hood seat pad for added comfort. Please allow 4-5 weeks for production of all retro furniture manufactured to your specifications.